The views of the former One Nation politician were always going to be controversial but we didn’t know how extreme until now. Indigenous people have shared their personal stories of racism on social media, after One Nation Senator Pauline Hanson said there was no definition of Aboriginal in an interview on the Bolt Report. 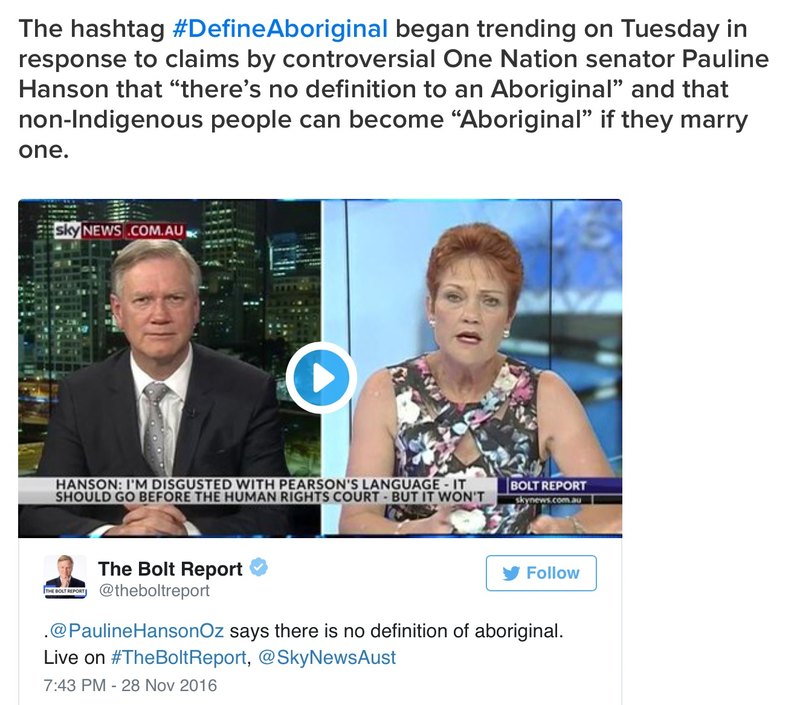 “What defines an Aboriginal?” Senator Hanson told host Andrew Bolt. “You know, there’s no definition to an Aboriginal. “If you marry an Aboriginal, you can be classified as an Aboriginal. “Or if the community or the elders accept you into that community, you can be defined as an Aboriginal. The Federal Government defines an Aboriginal person as someone of Aboriginal descent, who identifies as Aboriginal and is accepted as such by the community in which they live. Senator Hanson called for a debate into the definition. “I think the whole lot needs to be opened up, a big debate on this,” she said. “And to say that you’re humiliated or intimidated, I think that people need to toughen up a bit. I think we’ve all become so precious, we’ve stopped freedom of speech to have a say, to have an opinion. In response to Senator Hanson’s comments, the creator of ABC TV’s Cleverman, an Indigenous Australian superhero series, Ryan Griffen, took to Twitter. 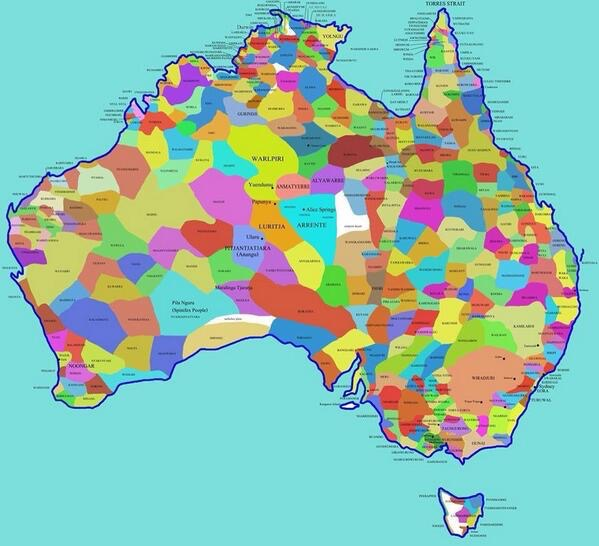 “Another white person telling us what it means to be Aboriginal. It don’t work like that,” he posted. He then encouraged other Twitter users to share their experiences, using the hashtag #DefineAboriginal. Check Twitter some of the responses. SBS said that the second season of First Contact would be confronting and they weren’t kidding. Six celebrities — talent judge Ian ‘Dicko Dickson’, ex One Nation politician David Oldfield, singer Natalie Imbruglia, comedian Tom Ballard, actor Nicki Wendt and former Miss Universe Australia Renae Ayris — spent 28 days visiting remote Aboriginal communities. In the first episode, the celebrities went to Kununurra, in the Kimberley, West Australia and then to the tiny community of Bawaka in the Northern Territory. Here are some of the most shocking moments. Martin told the celebrities that an Aboriginal woman is 35 times more likely to experience domestic violence than a non-Aboriginal woman. An indigenous person is three times more likely to commit suicide than you (celebrities). The core of the problem is poverty, booze and depression. In the past, Dickson has admitted to battling the booze but that only seems to have hardened his stance to alcohol problems in some Aboriginal communities. “I don’t hate them, I don’t love them, but maybe I don’t care or think enough about them,” Wendt admits. Later Wendt says: “I floss and brush twice a day without fail. Our hair’s going to be different. We’re going to smell different. In Kununurra, Ballard joins the local patrol service to pick up the drunk and vulnerable and take them to the town’s sobering up shelter. During patrol, Ballard sees a local man, Wayne, passed out in a park. When the patrol team tries to shake Wayne awake and he doesn’t react, Ballard gets emotional, suspecting the worst. “I thought maybe he was dead,” Ballard says. Jennifer Wilson is part of a support group for people affected by suicide. Wilson tells the celebrities about the plague of suicide affecting communities. The vast majority are men under the age of 30. The youngest family member of Wilson’s family to take his life was 11 years old. A young man tells of trying to hang himself. Ayris, who grew up in Perth, says “one time I was spat on and another time someone came up and just completely abused me. It is unforgettable.” Ayris also admitted she didn’t know what the Dreamtime is. When the six celebrities go to Bawaka, they visit the ancestral land of Timmy ‘Djawa’ Burarrwanga. Oldfield gets Burarrwanga off side when he refuses to get painted with red ochre, refuses to go fishing, and argues about Constitutional Recognition. But there is some sign of hope when Burarrwanga took Oldfield to his father’s grave. The pair spoke about their fathers and, according to Burarrwanga, Oldfield began crying.